“With such nagging she prodded him day after day until he was sick to death of it” (Judges 16:16). Samson was dedicated to the Lord before he was born. He was blessed with great power from God to destroy Israel’s enemies. Yet his one weakness is what brought him down—uncircumcised women. Delilah used his love for her along with her insistent nagging and her desire for riches to bring Samson down. Delilah’s actions remind us that it’s possible for the most spiritual among us to be deceived if we allow our flesh to have reign over our hearts and minds. “His wife said to him, ‘Are you still maintaining your integrity? Curse God and die!’” (Job 2:9). Job was a godly man who was hit in one day with the massive loss of wealth and worse—all ten children killed at once. His grief was enormous and yet he refused to blame God. At his lowest state of mind, his wife accused him of attempting to protect his integrity instead of truly worshiping God. His wife’s actions remind us that we aren’t to judge those who suffer, but rather to come alongside them and encourage their faith in the Lord. “The woman whose son was alive was deeply moved out of love for her son and said to the king, ‘Please, my lord, give her the living baby! Don’t kill him!’ But the other said, ‘Neither I nor you shall have him. Cut him in two!’” (1 Kings 3:26). One prostitute accidentally rolled over her baby in the night and killed him. She switched the babies and both women claimed the baby. When King Solomon asked for a sword to divide the baby in half, the prostitute who lied agreed with his decision. The other woman begged for his life. The baby was given to his true mother. The lying prostitute’s actions remind us that we must come to grips with our failings instead of trying to pass on our pain to others. The Israelite King Ahab chose Jezebel as his wife and she brought the worship of Baal with her. As a result the whole nation was plunged into idolatry, witchcraft, and sexual immorality. She led the killings of hundreds of God’s prophets and oversaw the killing of righteous Naboth for his property. In the end prophecy was fulfilled, she was thrown from the palace, trampled by horses, and her body torn to pieces by dogs. Jezebel’s actions remind us that God isn’t mocked—those who sow unrighteousness will one day be repaid with judgment for their actions. “When Athaliah the mother of Ahaziah saw that her son was dead, she proceeded to destroy the whole royal family” (2 Kings 11:1). Athaliah preceded to kill all the members of the royal family—thus her own grandchildren. It was a custom of those days to kill even the babies in order that no one can show up to take her place. She reigned as queen for 7 years before a priest presented Joash as the rightful king and heir of the throne. Athaliah was escorted out of the temple and promptly killed. Athaliah’s actions remind us that the most thorough and evil plans will never succeed over God’s purpose for His people. “The Lord said to me, ‘Go, show your love to your wife again, though she is loved by another man and is an adulteress. Love her as the Lord loves the Israelites, though they turn to other gods and love the sacred raisin cakes’” (Hosea 3:1). Hosea married Gomer at the instruction of the Lord. Together they had three children before Gomer left Hosea for another man. God used Hosea’s love for his wayward wife as an example of His love for the nation of Israel who pushed aside the truth of God for idols. Eventually Hosea purchased back his own wife and she returned home. Gomer’s actions remind us of how much God loves us even we have backslid into our sin—we need to come home and be made whole. “Peter said to her, ‘How could you conspire to test the Spirit of the Lord? Listen! The feet of the men who buried your husband are at the door, and they will carry you out also’” (Acts 5:9). Ananias and Sapphira sold their plot of land, but wanted to keep a portion of the proceeds to themselves. There was no sin in doing so; however, they lied to the Holy Spirit and the church by pretending that they were giving all the proceeds and not just a part. When Sapphira agreed with her husband’s sinful action, she was punished with her life just as he was. Sapphira’s actions remind us that we all have individual responsibility when we partake in the sins of others. 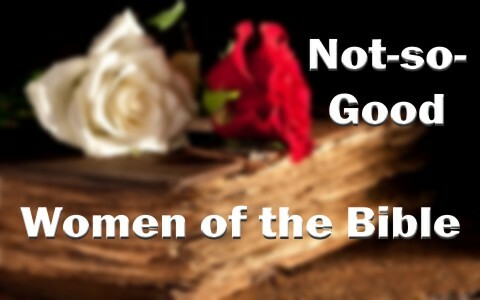 None of us can stand in judgment against any of these not-so-good women in the Bible because we’ve all sinned and have fallen short of God’s glory. Yet we can learn from the sins of these women as to not repeat them in our own lives. Those whom God loves, He will discipline according to His righteous judgment. By dealing with our sins, God shows His true agape love for us so that we may live freely in His peace and fellowship. Previous post: How Can We Identify When Satan Is Scheming Against Us?